I don’t know what gave me the idea but I was eating a tortilla one day a couple weeks ago and thought it would be great to make a weaving of colored tortilla strips. It took a week or so to hunt down colored tortillas. We found the green Spinach Wrap tortillas at Whole Foods and the spicy Habanero Lime tortillas at Trader Joes. 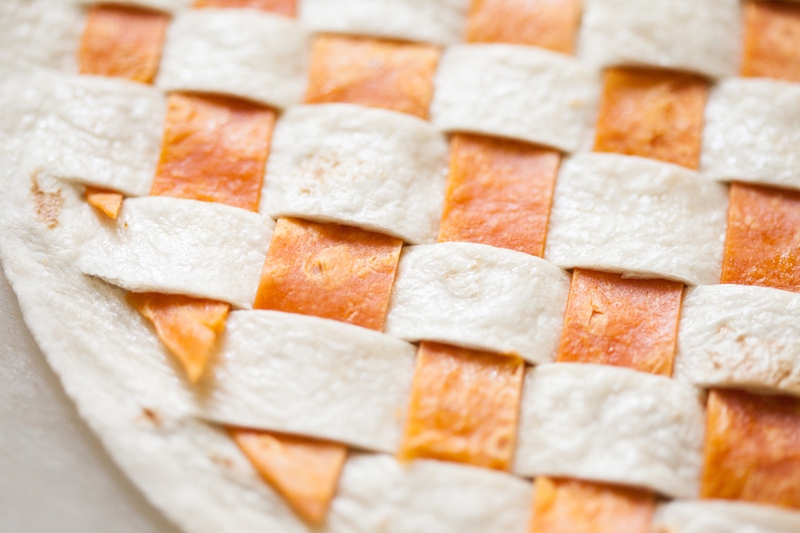 The first Woven Tortilla was made of strips of white and orange tortillas. I cut them with kitchen shears. 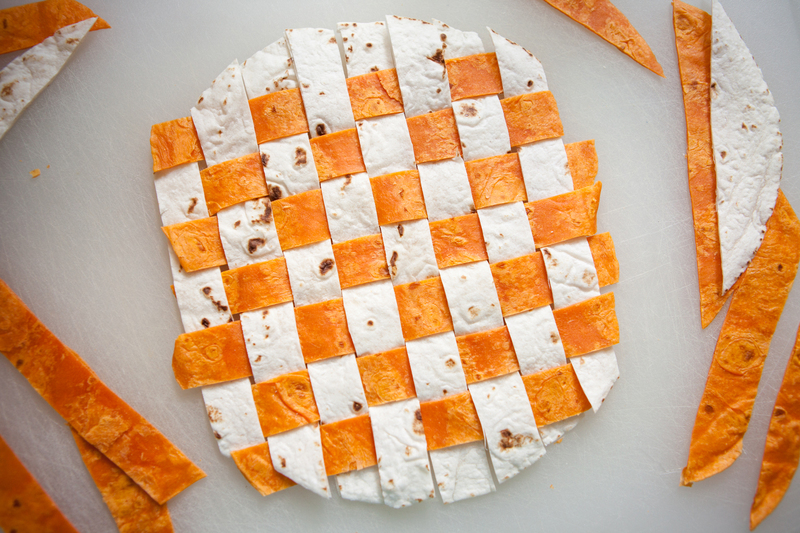 Strips of white Mission flour tortilla and orange Habanero Lime tortilla. The Habanero Lime tortillas were a little smaller than the white Mission tortillas. I ended up using the center section of two Habanero tortillas to get enough strips that were long enough. It was almost as easy as weaving paper strips, but tortillas are more fragile. None broke but I treated them gently. 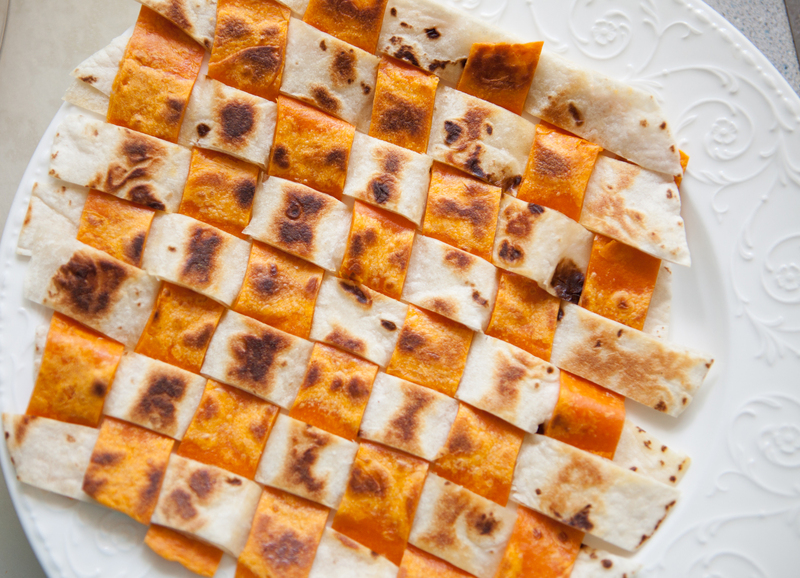 Spicy Habanero Lime tortillas are woven together with a white flour tortilla. 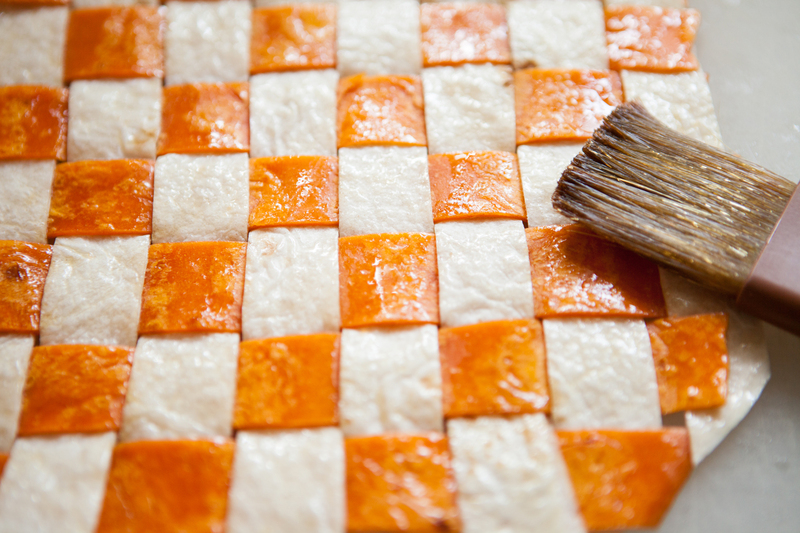 Brushing the woven tortilla mat with olive oil helped the pieces stick together. 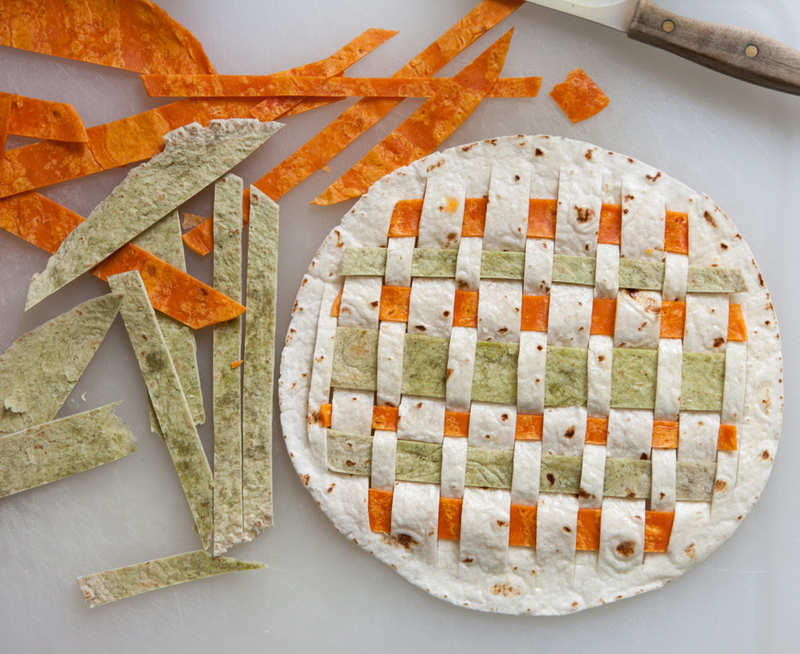 The woven tortilla mat is brushed with olive oil. They still weren’t very stable though so I had to slide the woven piece into the skillet using a big spatula. Once one side was browned on medium heat, I placed another hot skillet over top and flipped it over. That was tricky! The tortilla mat still folded in half and it was a bit of work straightening out the strips. 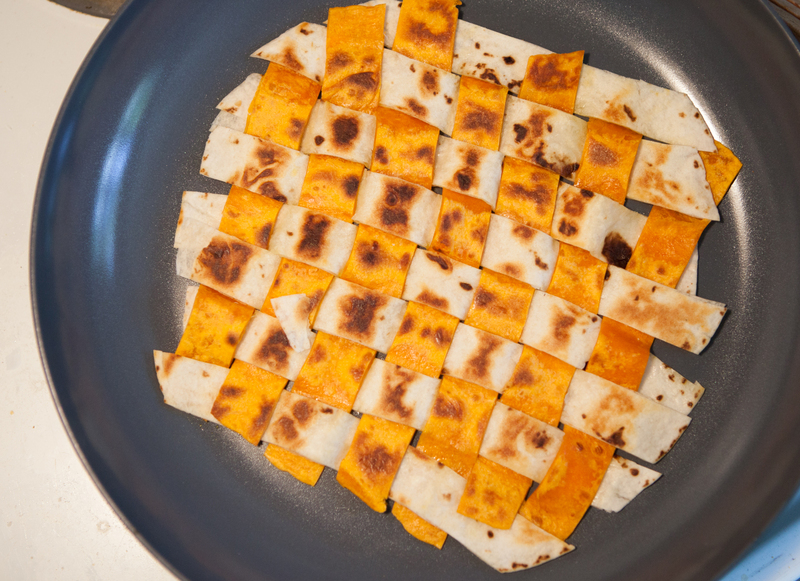 The woven tortilla mat is lightly toasted on both sides over medium heat in a skillet. Once they were lightly browned, the tortillas were more crisp and held together better. I slid the finished tortilla mat out of the skillet and onto the plate. 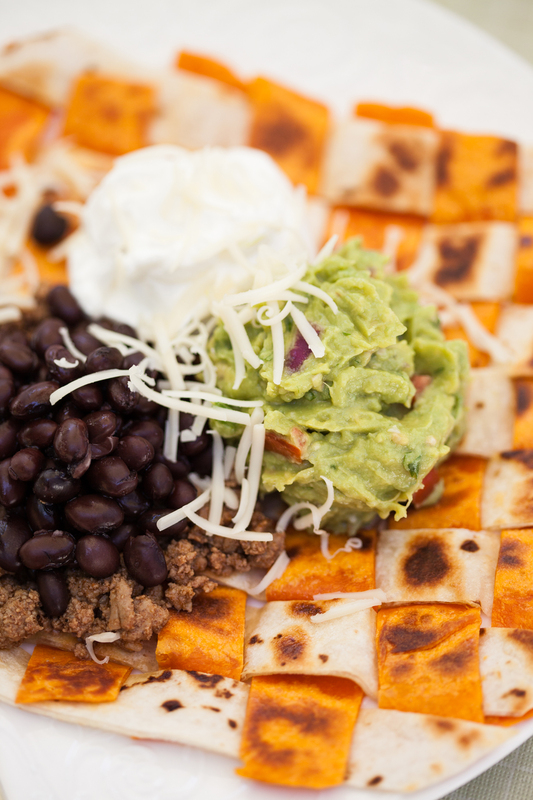 Topped with black beans in a taco meat nest, scoops of guacamole and sour cream and a sprinkling of white cheddar, the Woven Tortillas looked and tasted wonderful! 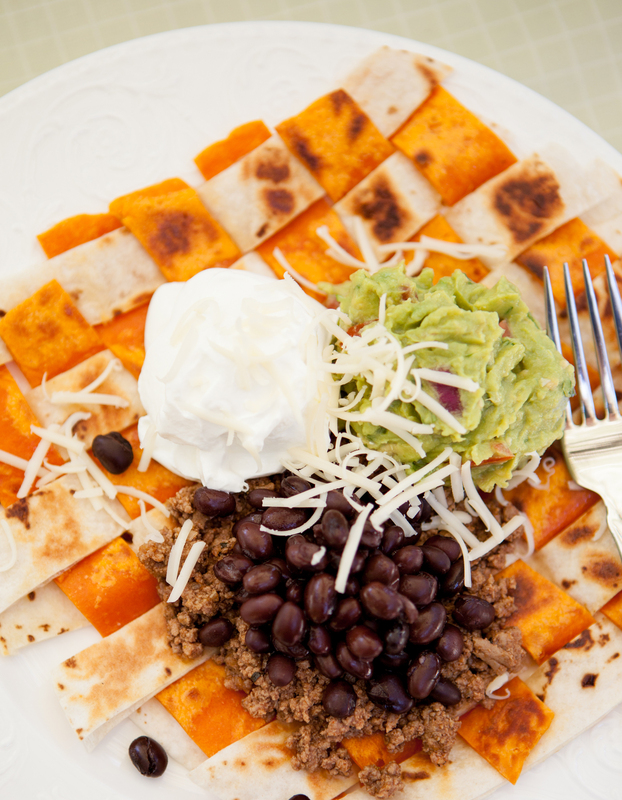 Woven Tortillas, served with taco meat, black beans, guacamole, sour cream and cheddar cheese. Use knife and fork to eat. I tried another method of weaving that stayed together easily. 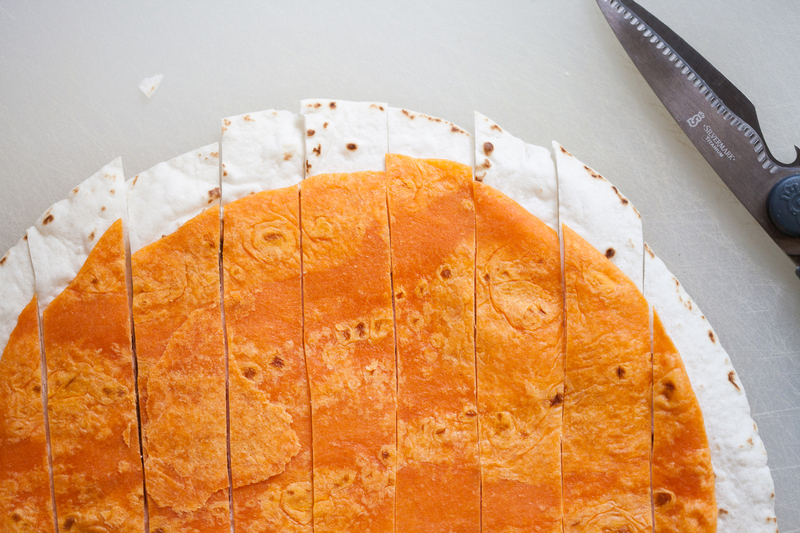 Instead of cutting the white tortilla into strips, I cut slits in it with a knife, then wove strips of colored tortilla through the slits. 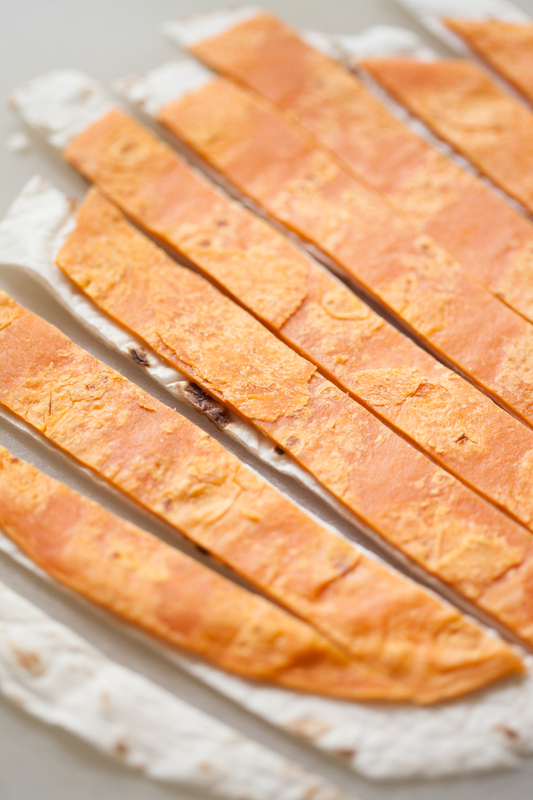 Strips of Habanero tortilla are woven through slits in a white flour tortilla. This time, I brushed olive oil on the white flour tortilla before weaving so the oil would help hold the pieces together. That worked great. Treating the tortillas gently so the one-piece white tortilla didn’t split at the ends, I carefully wove orange Habanero and green Spinach tortilla strips through the slits. 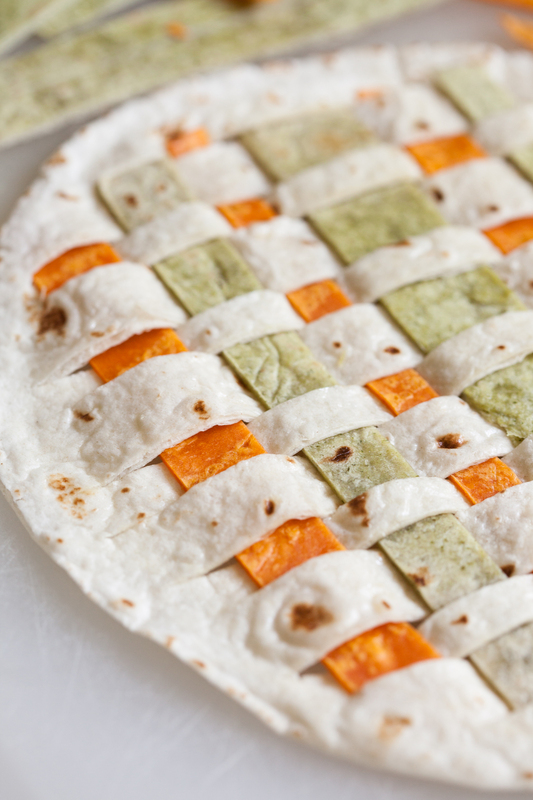 Green and orange tortilla strips are woven through the slits in a white flour tortilla. 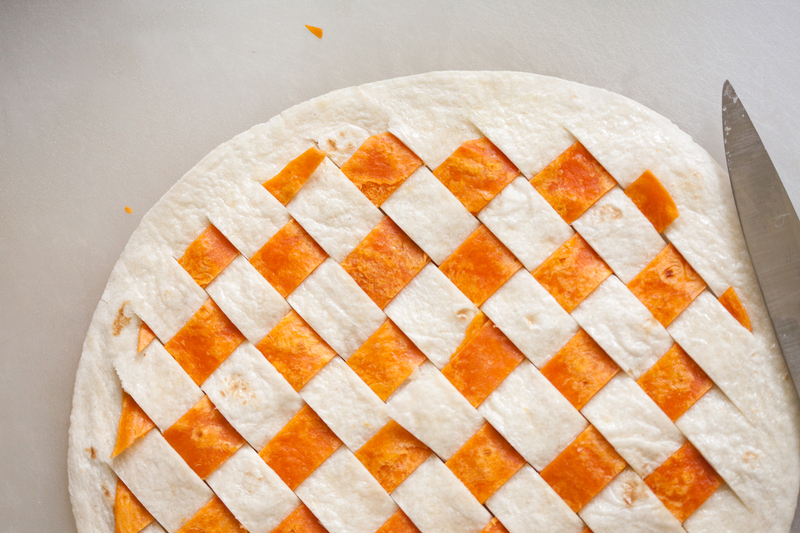 Woven Tortillas are so fun and festive! Tasty too! These take time so I recommend weaving them ahead of time, wrapping air tight and keeping the woven tortillas in the fridge. Brown them on medium heat right before serving. 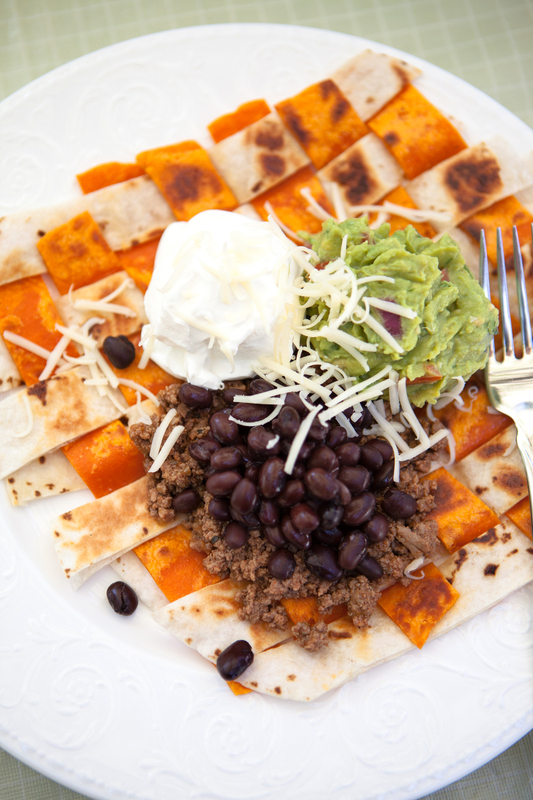 Woven Tortillas – great way to add color and flavor to a Tex-Mex meal. Lunch was festive and delicious! How fun is that!!! Thanks for a great idea, Julia! I’m glad you like the idea, Jeanette! I’ll be making these again when I have lunch guests. The woven tortillas are great to do ahead.